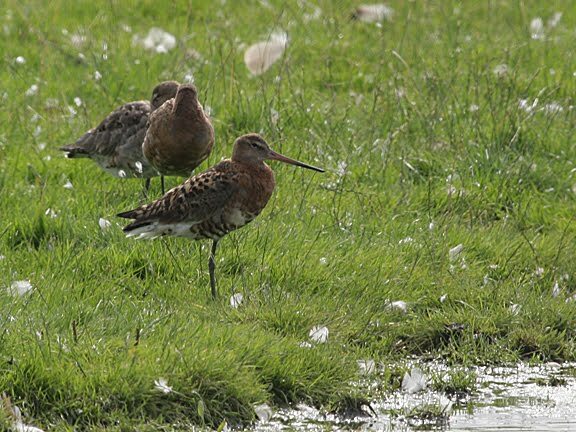 From the muddy banks of the Dee....: Chasing Godwits.... part deux! The number of Black-tailed Godwits at Gilroy was zero a few days ago, but numbers have been steadily building, heading towards 50 birds feeding and roosting around the flooded field opposite the actual Nature Park. So I thought anothe trip there was in order. 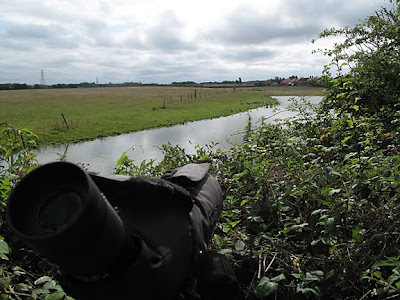 I'd packed the camera this time after missing out on the opportunity of good Greenshank shots on Thursday 5th (see Chasing Godwits post) so I was pretty weighed down with kit. Scope, tripod, camera and bins all made for a slow cycle ride there. I struggled through the kissing gate (fair enough as I shouldn't be cycling on a public footpath!) and surveyed the scene. 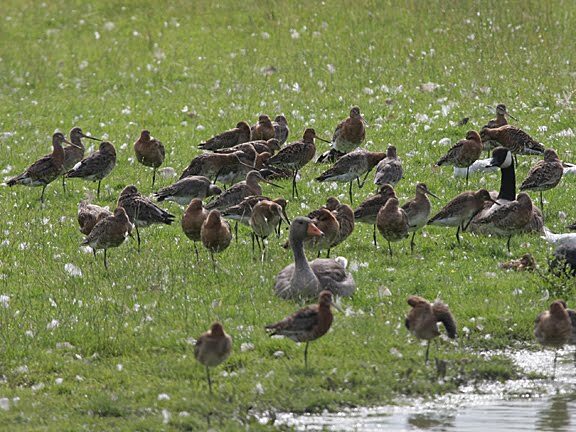 From this far I can see that there are plenty of Godwits for me to scan for colour rings. 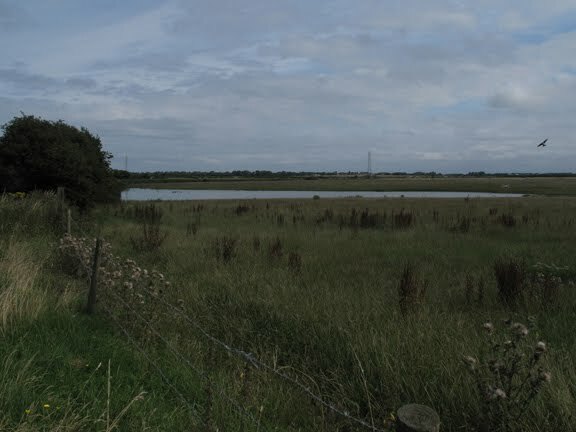 There are also loads of Swallows and House Martins over the long grass, and a Swift swoops down and take something from the surface of the water. I can hear a Common Sandpiper, but I can't see it. It must be on the tree covered bank adjacent to the path. It's the only part of the water's edge I can't see. No sign of Thursday's Greenshank. There are a couple of gaps in the hedge that fellow birders have made to get better views of the birds on the field. The one I'm after is unoccupied so I shuffle in and set up the scope. I first count the birds, 57, then check the visible legs for colour rings. As usual there are some wading belly deep in the water so the legs are not visible, others were obscured by a couple of roosting geese. A little bit of patience will be required I think to myself. I decide to try and get a couple of pictures of some of the feeding birds, but they are a little distant. I get a few frames of some roosting and preening on the bank. Eventually I reckon I've seen all the legs and they are ringless. I'm not too down-hearted as it is now a rather pleasant day. I spend a while watching the Swallows wheeling around the sky above me then return to the Blackwits. There are a few juvenile birds here, but most are adults. The birds on the Dee tend to be from the race islandica and the ones here now seem to move on and winter in France and Portugal, being replaced by the larger flocks that feed on the Dee at Thurstaston and Heswall. I have seen about 4 Blackwits between Thurstaston and Heswall this week compared to neary 60 here today. I leave the reserve and head home for a bite to eat, relishing the thought of numbers continuing to rise and the opportunities for photography that will come my way.... maybe tomorrow?